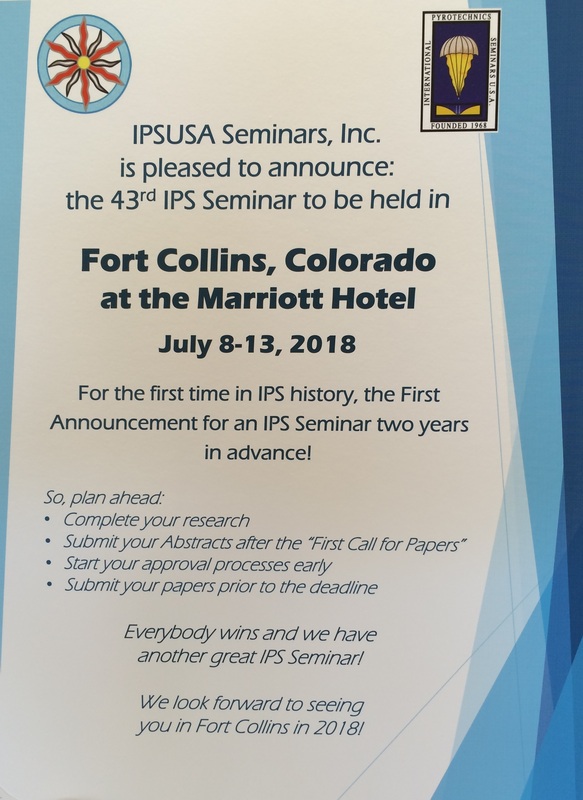 The 43rd International Pyrotechnics Society Seminar took place at the Marriott Hotel in Fort Collins, Colorado, 8-13 July, 2018. This was the first time the seminar was formally announced a full two years in advance. The Co-Chairs for the 43rd Seminar were Dr. Jared D. Moretti (U.S. Army, RDECOM-ARDEC) and Dr. David F. Dye (U.S. Navy, NSWC Crane). Please visit the IPSUSA website for more information. 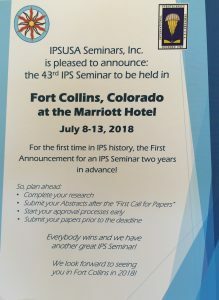 The 15th Workshop on Pyrotechnic Combustion Mechanisms was originally scheduled to occur in conjunction with the 43rd IPS Seminar in July 2018. It has been postponed until 2019. It was felt that holding a second workshop so close to the one being held in Germany in June 2018 might affect the quality of the papers being presented at both meetings. Please watch for further announcements.